In the main menu „Tickets“, you have an overview of all tickets assigned or created by you. PlanRadar has two different options to view your tickets. 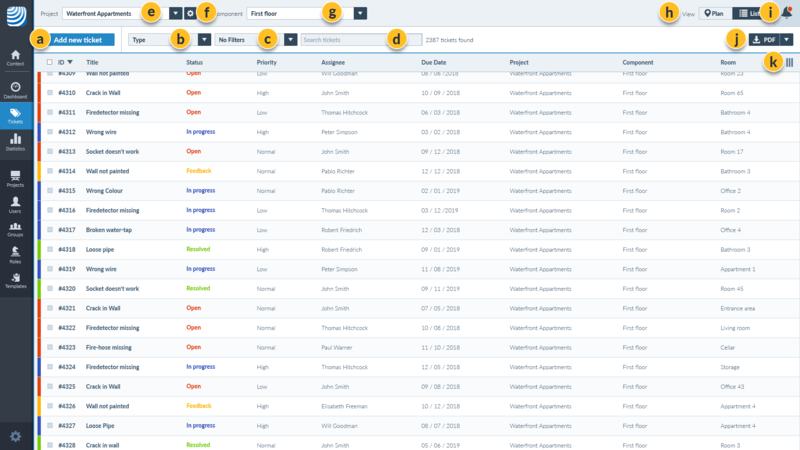 In general, the list view is displayed. 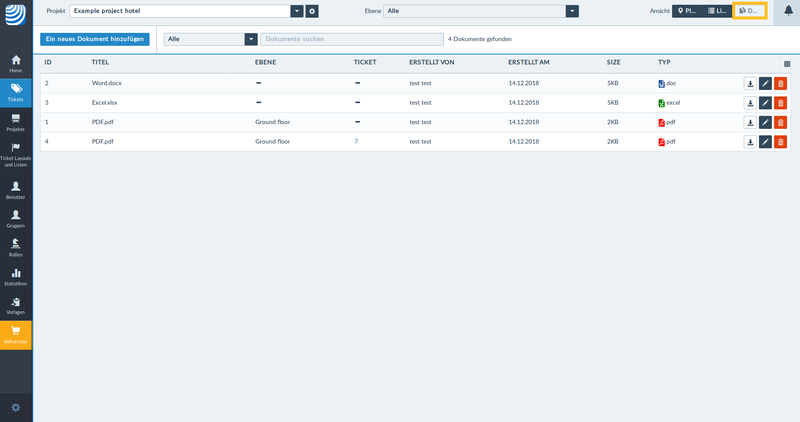 It shows an overview of the tickets in a list format. Regardless of the view type, you can sort and filter tickets. Use this button to create new tickets (see „Create ticket“ for more information). 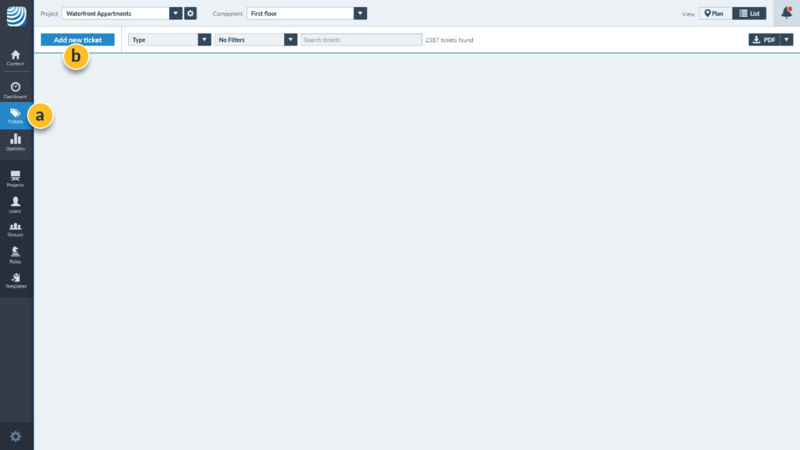 Here you can filter according to the layouts you created (see also „LAYOUTS & LISTS“). You can create, save or edit filters (For details see „Create filter“). Through the search bar you can filter for any keywords. 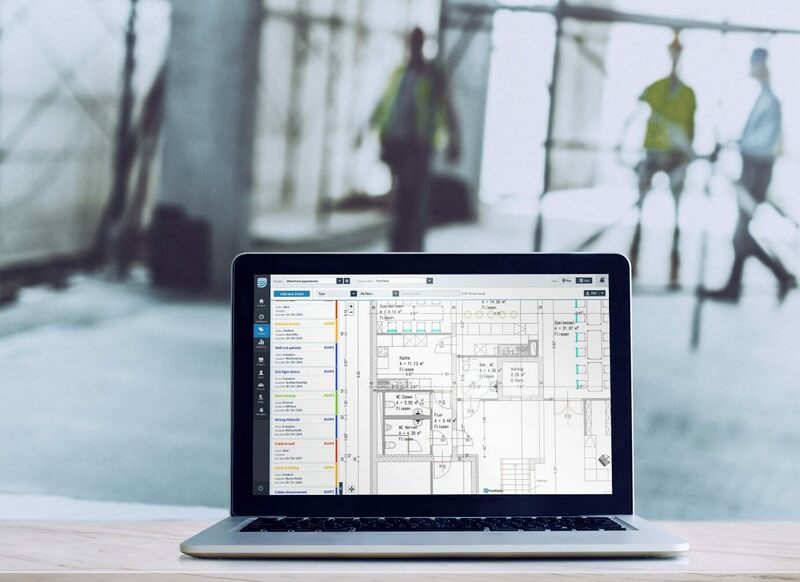 Select available projects or switch to another project. Go to the details of the selected project (see „PROJECTS“). Here you can select a level or a floor. To see the tickets of all levels, go to the list view (see „List view“ for detailed information) and select „layer“, „all“. Switch between list or plan view. Export ticket list as PDF or Excel file (see „Export reports or list of defects“ for detailed information). Hide / Show columns: Clicking on this icon will bring up a drop-down menu. Here you can use checkboxes to select or deselect which ticket details you want displayed or hidden. Multiple selection: These checkboxes allow you to edit all or selected tickets at the same time. In the list view, you can directly change “Status”, “Priority”, “Due date”, “Asignee” and “Progress” without having to open the ticket. To do so, click on either the status, the priority, the person in charge or the progress and use the drop-down menu or the progress bar to set the new status. In addition, you can sort them by ascending or descending order by clicking on one of the displayed categories / ticket details (ID, title, status, priority, etc.). Download ticket details as a PDF report: Click this button if you want to view the document. Once you click on the download icon, the document will automatically open up for you to view. Copy to clipboard: Click this button if you want to copy this ticket. All information and properties of the copied ticket will be taken over. This allows you to create tickets even faster. Determine plan position: Click this button if you want to move the pin to another position on the plan. Delete: : Click on this button, if you want to delete the document. Thereupon a pop-up window will appear, in which you have to confirm or cancel the deletion. In addition to the ticket and plan view, you can also view only your documents. Download: Click on this button if you want to view the document. Once you click on the download icon, the document will automatically open up for you to view. Edit: Click on this button if you want to get into the detail settings to make changes. To upload a document, click on „Add new document“. In the apparent view, click on „Add documents“ again. Select the document to be uploaded (you can also select multiple documents at the same time) and click on “Open”. Alternatively, you can also add the documents via drag & drop. You will immediately see the selected documents in the selection window, as well as in the background, and you can also rename them. If you leave the “Title” field empty, it will automatically adopt the file name. In addition, you can select the plane to which you want to assign the document. 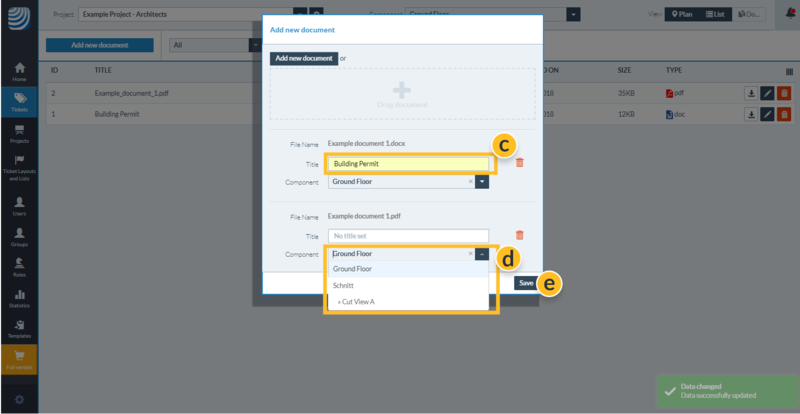 Depending on whether you create a ticket in the plan view or list view, you select the plan location of the defect either before (plan view) or after (list view) filling out the ticket details. Click on the „Create ticket“-Button in the upper left corner. 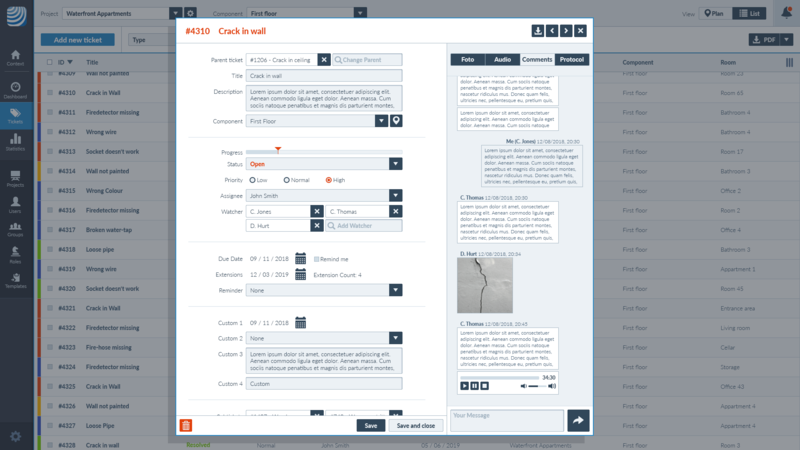 The detailed view appears in which you can enter all information. ALTERNATIVE! If there is a plan, click with the right mouse button on the plan, with the left mouse button move the pin to the desired position and confirm the position with the green tick. In the detailed view of the tickets you can see all important information and options of the selected ticket. Title: Here you enter the title of the defect (for example: Crack in the wall). TIP! When selecting a title, keep in mind that you select terms that you may want to search for or filter later on. (In the case of frequently occurring defects, it makes sense to supplement the title with additional information, such as the location of the defect – for example: crack in the wall, 1st floor). Parent Ticket: The parent ticket serves to be able to assign several defects (so to say sub-tickets) to a main defect (parent ticket). Using the drop-down menu, you select an already existing ticket for your parent ticket or create your own which you want to assign to the defect. ANNOTATION! This feature is very helpful, especially in the case of serious deficiencies, which usually cause several subsequent defects. Component: Here you select the floor or the level in which the defect is located via the drop-down menu. To the right you will also find a “pin” symbol. 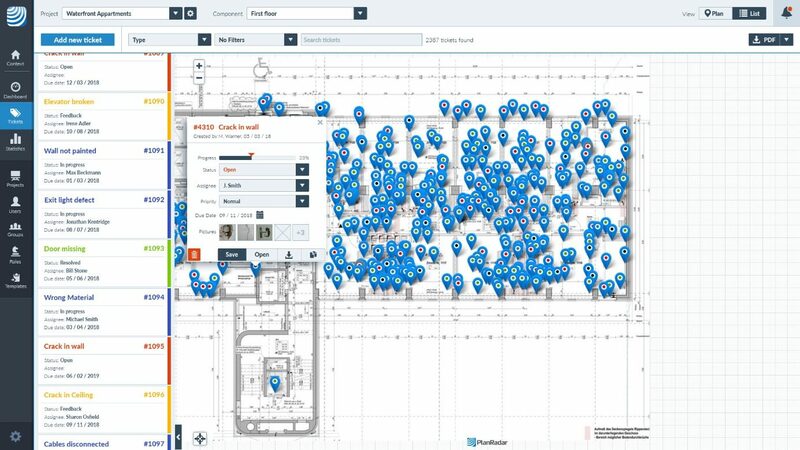 With a mouse click you get to the plan view in which you can define the plan position. Progress: With the progress bar you set the degree of completion of the deficiency. To do this, click with the mouse on the controller of the progress bar and keep it pressed to move it. 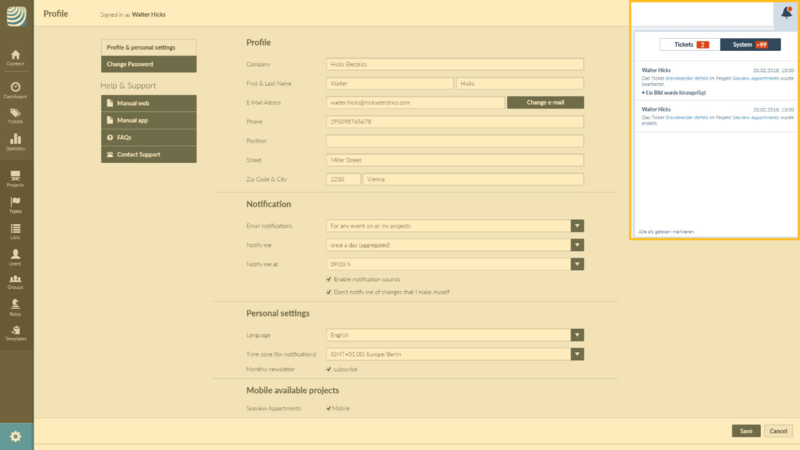 Status: Here you can select the respective status in the drop-down menu by clicking on the input field: “Open”, “In progress”, “Feedback outstanding”, “Rejected”, “Completed”. Priority: Here you classify the priority of the defect and select between: Low, Medium and High. Receiver: Here you can select one of the listed users by clicking on the dropdown menu. This user can see the tickets and edit them according to their permissions. Due date: Click on the calendar icon to set a due date for the defect to be rectified by the assignee. Set Extension: If it turns out that an extension is required to complete the ticket, you can set a new date here by clicking on the calendar icon. Custom attributes: Here you will find the attributes previously defined by the user under “Layouts & Lists”. These depend on the assigned ticket layouts (for detailed information see „LAYOUTS & LISTS“). PDF-Export: In the ticket detail view, you have the option of exporting a summary of the defect as a PDF. To do this, click on the “Download” icon in the top right corner. A drop-down list appears, in which you can choose to create the report without or according to a template. Templates are only suggested if you have already created some under the menu item “Templates”. (see „TEMPLATES“ for more information). Click on the desired voice message. Forwarding or rewinding is possible by dragging the bar with your mouse´. On the left side of the ticket view, select the tab „Docs“. Click the „ “-button. On your computer, select the photos you want to upload. Alternatively, you can also add documents by dragging and dropping. Here the written exchange of information takes place between ticket creator and contractor. All comments, uploads of media (photos, voice messages) are recorded chronologically and permanently. Subsequent deletion of comments is no longer possible after clicking on the “Send / reply button” ( ). All changes and comments to the ticket are logged. Current updates to the tickets (eg “done”, “change of deadline”, etc.) and system notifications (eg: plan upload) are displayed here. You can choose to show only the log, the comments, or both. NOTE! On the right side of the ticket view you can see not only the actions applied to the ticket in chronological order, but also have an additional filter function to choose which attributes (Comments, Images, Audio recordings, Protocol) to show or hide. By clicking on the “Bell”-symbol in the top right corner you can see all the notifications. It’s separated between notifications about tickets and concerning the system. To do this, open the drop-down list by clicking on the arrow symbol in the upper right corner. Select whether to export the list in PDF or Excel format. Photos, text and layout are exported to every defect. To access tickets, first go to the “Tickets” menu. You will see a list of all tickets that you can access with a mouse click. There are in general 3 ways to filter for tickets. You can narrow down the list by ticket layout (see „LAYOUTS & LISTS“), custom filters (see „Create filter“) and quick search (see “List view” or “Plan view”) to find and easily edit your tickets. Click on “Filter” in the menu bar and then on “Create filter”. 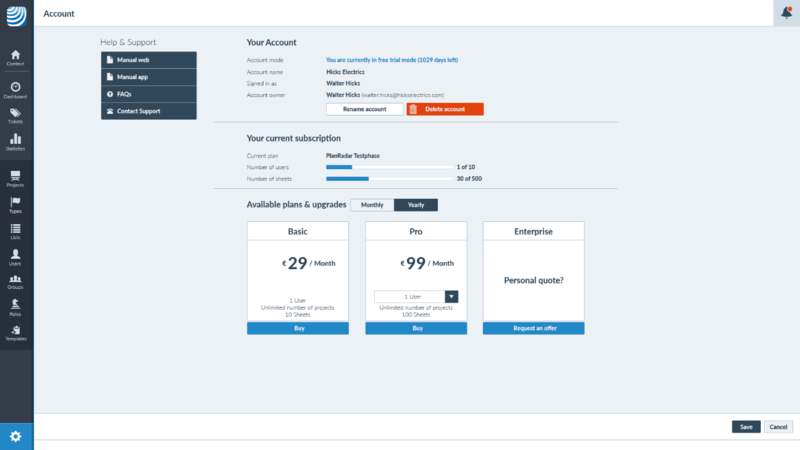 A window with the options will appear on the right. 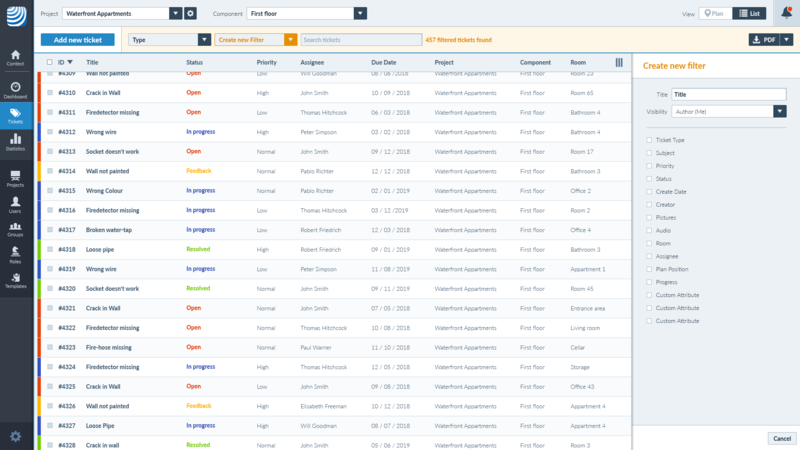 Visibility – Select whether the filter should be visible to all project participants, in-house users or only to you. Choose Filter-attributes (f.e. : Date = 04/19/2018). You can also add more filter criteria. To edit the filter, select the existing filter in the drop-down list “Filter” and then click on “Edit filter”. Click on the ticket you want to edit. If available, here you can see all Sub-tickets assigned to the Parent-ticket. By clicking on it you will be taken directly to the sub-ticket.